Excellent Polish food--again--in central Florida: that sums up my first--but certainly not last--visit to Anna's Polish Restaurant. I'd heard that a second Polish restaurant was opening in the Orlando area, and I was very excited. When I found the information about Anna's Polish Restaurant on urbanspoon.com, I knew it was only a matter of time before I got there. That time happened today! 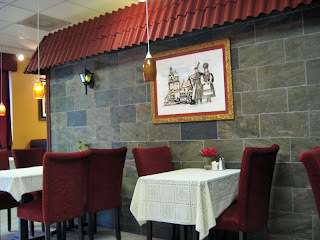 I am not going to compare Anna's to the other Polish restaurant in the Orlando area, Polonia. Both are great, and both are places I highly recommend. But Anna's can stand on it's own--after being open only four days! We'd been to the Winter Park Arts Festival. Since we were in that area of town, I suggested we seek out this new Polish restaurant I'd heard of and see if it was open yet. So we ventured to the east side of Winter Park to see. Sure enough, we found a "now open" sign at the location occupied several years ago by Polonia--before they closed, then reopened at their current Longwood location. But walking into Anna's, i knew I was in a different place. The location has been totally remodeled and looks like somethign I'd expect to find in Poland. Dark wood and waitresses dressed in Polish traditional attire, I felt I was in a different world. At some point in time, we noticed Chopin as background music--that was a very nice touch. We were quickly greeted and offered our choice of seats. Anna's is not a large place, but is cozy and intimate. We were quickly offered drinks and given time to study the menu. I was amazed by the variety of the menu. Lots of various dishes that I'd consider traditional Polish food graced the menu. Eventually , we settled on our order. We decided to begin with an order of pierogi--one of each: potato and cheese, sauerkraut and mushroom, and meat. I due time our appetizer arrived, garnished with the traditional caramelized onions. We asked for and promptly recieved some sour cream. Oh, and the pierogi? They were very good. No, actually, they were great. But then again, I've never met a pierog that I didn't love. The meat one was especially wonderful and had an exquisite seasoning like none I've ever tasted. Very good. I ordered the barszcz (beet soup) to go with my meal. I found it very good but it was lacking in a bit of acid. No problem, I took some of the lemon out of my iced tea and squeezed that into my barszcz--that was exactly what it needed and now it was perfect. The barszcz was rich and hearty and had lots of beet in it along with some other things. I detected a bit of potato and also beet tops and stems. It was served with a dollop of sour cream and some dill--a traditional and nice touch. If you read my blog regularly, you know I made my own barsczch for Wigilia this past Christmas. This barszcz was, once I added the squirt of lemon, equally good--a success for sure! Neither my friend Tommy nor I was all that hungry, but yet I persisted, because I sensed great food was happening. I was right! Tommy--being much more sensible than me--ordered the Potato Pancake appetizer for his lunch. Three crisp, warm, fried potato pancakes were served with a side of apples. They were very good. there was a hint of onion but not overpowering, and the pleasant taste of potatoes. Along with the applesauce and a bit of sour cream, they were absolutely delicious. I'd have them again in a heartbeat. But I was not so much hungry as I was gluttinous--I wanted it all. So I ordered a dinner. I really wanted to try one of everything--it all looked so good. But eventually I settled on the Pyzy. Yep, Pyzy. Our waitress did not know what I was referring to until I pointed to it on the menu (but I'll give her a break--she admitted to being German and this was Anna's 4th day of being open). Pyzy are little bits of heaven... I had mine with the mushroom sauce.... a good choice. Small round bits of shredded or ground meat (pork in this case) are encased in a potato dumpling/dough and steamed or boiled. The were exquisite! You'll notice in the picture that I've cut one in half, to show what's inside. The mushroom gravy that accompanied them was bursting with a hearty mushroon flavor, as good as any I've ever had. This was truly a very good dish. The plainness of the dumpling was complimented by the spicy flavor of the meat filling, and all tied together by the mushroom gravy. It was truly heaven. For a go-with I settled on a Cabbage salad, after questioning just what it was. It was served warm and was cabbage cooked with some bacon and dill. The flavors were very good. The cabbage was not overpowering, but the dill was pronounced. I liked this side dish--it was unlike anything I've ever had before but I'd certainly have it again. It was quite unique and quite tasty. Our waitress was very attentive and fairly knowledgeable about the food--pronounciation notwithstanding. There were several other tables of diners there, and we gathered that one was a table of repeat visitors--impressive for a place that's only been open 4 days. Another was a table of Polish-speaking people--I believe in some way related to or friends of Anna and the owers. A young man that was about the area is apparently the front of the house manager, though he never really greeted or spoke to us until we were leaving. Nonetheless, our experience at Anna's was great and I know that, if they keep doing what they were doing on this visit, I'll be back time and time again. It was excellent and I highly recommend you try it out. Wow I would absolutely LOVE to eat here. I adore Polish food!